We welcome everyone to join us on Tuesday 16th April with a launch party at Olby’s Soul Cafe from 7pm. Have a drink and some nibbles and be entertained by a range of Thanet’s theatrical folk, brought together through Adventures in Performance and 6 years of Looping the Loop. After the intergalactic whirlwind that was Season 11, Looping the Loop returns to Earth for another trip around the Isle. From Shakespeare's star crossed lovers at war, to a multisensory extravaganza for babies and a hard hitting immersive installation. Season 12 promises to provoke, entertain and challenge! Looping the Loop Creative Director Ellie Jones is back to kickstart proceedings with Almost Alice, a brand new adventure in the MadVentureVan. Join Alice at Broadstairs Bandstand on Saturday April 20th and Ramsgate Harbour Parade on Sunday April 21st between 11am - 4pm as she ventures down the rabbit hole into the bizarre world of Wonderland. Using puppetry, music, and live performance all within the intimate setting of our wacky caravan, Almost Alice will be an unforgettable experience for people under 8 and their families. And if that’s not enough wonder for you, then the We Are Nearly Normal Street Theatre team has you covered as they bring you the ‘Wonderland Wabbits’. Follow the White Rabbits through the wonderland of Broadstairs and Ramsgate as they try to get to an important meeting on time! Catch them while you can, they won’t stay for long...they’re late! Filskit Theatre’s Kaleidoscope is the first of three shows brought to us this year by Battersea Arts Centre. Taking place in the cosy surroundings of St Peters Baptist Church, this multi-sensory experience for 6-18 month tots (and their grown ups) uses interactive light, puppetry, movement, and sound to delight and entertain young ones. Shows commence on Thursday April 25th at 11:15am, and 1:30pm with a further two performances on Friday April 26th at 10:00am and 11:15am. For those interested in getting involved, Filskit Theatre will host our weekly FLEX skill sharing session with a workshop focusing on ‘Making Theatre for Children.’ This FREE workshop takes place on Thursday 25th from 6pm - 7pm at Archive Homestore and Kitchen, Ramsgate. Our second Battersea Arts Centre show takes us to the beautiful Grade II listed Theatre Royal Margate on Thursday April 25th at 7:30pm for Lost Dog’s Juliet and Romeo. In this masterful blend of dance, theatre, and comedy, audiences will discover that contrary to popular belief Shakespeare's heroes survived their tragic demise. But now they are older, wiser, and in couples counselling. Directed by Olivier Award nominated Ben Duke, Juliet and Romeo is not to be missed. To the seafront next and to the Turner Contemporary for the third show brought to us by Battersea Arts Centre, Now is the Time to Say Nothing. With the use of stunning video and immersive sound the audience will be thrust into the real story of Syrian artist Reem Karssli. An intimate exploration of what it means to stay connected to each other and what happens when war and the need for survival gets in the way, Now is the Time to Say Nothing promises to be an experience like no other. Shows take place on Saturday April 27th at 11:30am, 1pm, 4pm, and 5:30pm with a further two performances on Sunday April 28th at 10am and 11:30am. Looping the Loop is thrilled that local community arts group Inspiration Creative C.I.C will be part of our Adventure in Performance with their show Labelled. Exploring how labels can affect us the performance will use acting, singing, dance and movement to tell the story of five characters feeling the weight of the labels that have come to define them. British Sign Language is used throughout the performance. Taking place at Theatre Royal Margate on Saturday April 27th at 2pm and 7pm. Following Inspiration, you are hereby Royally summoned to St George’s Hall Ramsgate on Sunday April 28th at 2pm for Bindlestick Theatre’s: Shakespeare’s Royal Company - The Original Game of Thrones. Meet Shakespeare’s Kings and Queens in this side splitting tour-de-force of slick comedy, suitable for all the family. Refuse these power hungry monarchs if you dare! At the end of the week is the premier of local talent… Actor Trudi Jackson’s hilarious one woman show Julie’s World. Julie is THE latest #influencer and YouTube sensation to hit 2019! Expect to learn a bit more about life, DIY, guitar playing and everything else, from how to change a leaky tap to repairing your roof, the art of drilling and even making chicken stock. You can catch Julie’s debut live appearance at St George’s Hall Ramsgate on Sunday April 28th at 8pm. Bringing the season to a close we have Stage Fright at Theatre Royal Margate on May 10th and 11th at 7pm. Written and directed by Darren Hill and Jessica Barrett and performed by the members of the Theatre Royal’s Senior Youth Theatre, Stage Fright offers scares, laughs, and an occasional rumba. As an added bonus on Friday May 10th all under 16s can attend FREE. 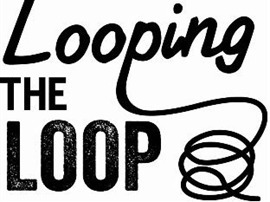 For full festival event information, and to book tickets, please visit www.loopingtheloopfestival.org.uk or pick up a programme at visitor centres and many other venues around Thanet.